Proud distributor of a range of market leading suppliers including Unios, Studio Italia, Nordlux, OLEV & Linea Light, we also offer a comprehensive range of LED downlights, modern exterior landscape luminaires, exquisite chandeliers, and the exclusive Italian designer pendants. We understand that it’s the little things, the finishing touches, that complete a home and create rooms of refinement to transform a space. Our class is evident in our extensive range of luminaries from the bespoke Italian designed feature pendants and wall lights on display to a comprehensive range of LED downlights and modern exterior landscape luminaires. Visit our newly refurbished showroom located in Malaga and let HS Reflections light up your life and illuminate your home. HS Reflections is locally owned and operated and the team has a wealth of experience in lighting design and understands the best ways to make lighting accentuate your home and living environments. The team at HS Reflections have been in the lighting industry for over 35 years working across the retail, wholesale & commercial sectors. We can share our knowledge to help establish and deliver your lighting needs for your project, residential or commercial. We are proud to offer clients a complimentary, obligation free consultation service. We recommend making an appointment to avoid any lengthy delays and to ensure you have our undivided attention. Bring your plans or any pictures of the spaces you are looking to enhance, and one of our consultants will be happy to make listen to your needs and work with you to create a design that best suits you and your lifestyle. 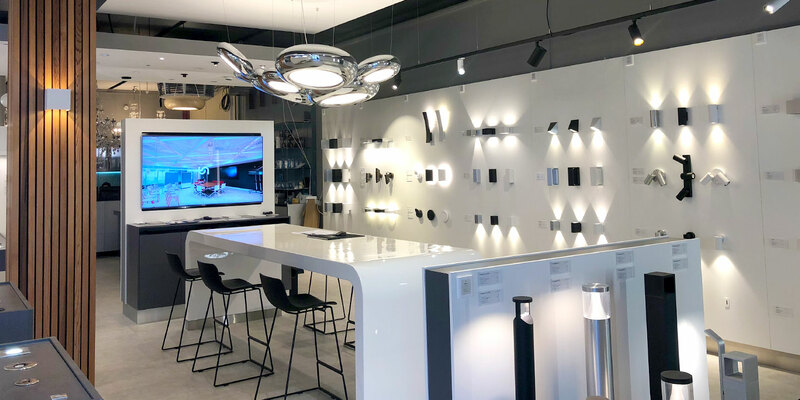 Our showroom in Malaga gives clients an opportunity to view our full range of light fixtures and fitting on display while also viewing our gallery of completed projects across Perth. From the latest LED landscape lighting products to gold plated crystal chandeliers and the exclusive Italian designer pendants. There is guaranteed to be something for everyone in our store. With our massive import power and diverse range of suppliers, HS Reflections can offer our customers something other suppliers can’t. Importing the majority of our stock from international wholesalers, gives us access to the latest lighting designs at reasonable prices. This allows us to customise orders based on the client’s exact specifications. It’s our focus to develop lifestyles not just houses, teamed with our attention to detail that gives HS Reflections its exceptional reputation of providing first-class designs & service and excellent prices.